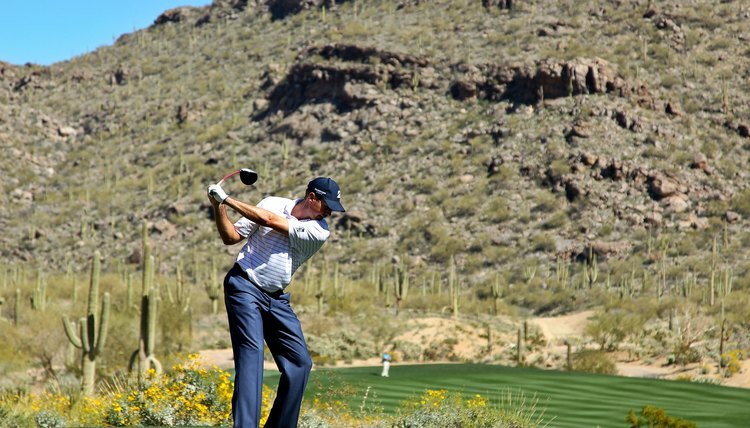 PGA Tour pro Matt Kuchar rotates his upper body perpendicularly relative to the spine in his one-plane swing. Golf instructor Jim Hardy has classified golf swings into two main types: one-plane swings and two-plane swings. Bob Wyatt of the United States Golf Teachers Federation notes that one of the key elements of the one-plane swing, according to Hardy, is the “upper torso rotating perpendicularly around his centralised spinal axis.” That perpendicular motion isn’t included in the two-plane swing. Hardy’s distinction between a one-plane swing and a two-plane swing focuses on the golfer’s lead arm -- the left arm for a right-handed golfer. If the lead arm is parallel to an imaginary line drawn between the shoulders at the top of the backswing, the golfer is using a one-plane technique, including the perpendicular upper body turn. If the lead arm is at a more vertical angle relative to the shoulders, it’s a two-plane swing because the arm angle and shoulder angle lie in two different planes, according to Wyatt. The upper body movement will not be perpendicular to the player's spine. Hardy says the key characteristics of the one-plane swing include keeping your head “relatively still” on the backswing, swinging the club around the body, “turning your body as hard as you can” on the downswing, and attacking the ball “aggressively” with your trailing hand (the right hand, for a right-handed golfer) at impact.